Is chess missing a sizeable market? Who has the neatest handwriting? When I first started playing serious chess as a 16 year old, beating an adult player was a real achievement. It did not matter how strong they are, it was the fact that they seemed a lot older than me that was important. While I'm pretty sure the first 'grown up' I beat in a serious game was Alan Runciman, my early games against Bill East seemed to stand out. We played each other on several occasions and the games followed a familiar script. He was usually White and played the Ruy Lopez. I would wheel out the Marshall Gambit, and we would play the opening quite quickly, until we both ran out of theory. We would then play a few more moves that looked sensible, and then I would find a tactic and win. The next time we played, we would both play slightly more theory (having down a little research in the meantime), then I would find a tactic and win. This happened on at least 2 occasions, and possibly 3. Of course this all happened almost 30 years ago so my memory is a little hazy on the details. Fast forward to this evening when we were paired to play each other in the first time in over 20 years. Bill once again opened 1.e4 and away we went. This time we managed to bash out 22 moves of Marshall theory (not all of it perfect) until Bill grabbed a very poisoned pawn on b5. And just like in the olden days, I found a tactic. At least we both could see the humour in the situation and Bill even promised to learn a little more theory for the next time we meet. The Guam Chess Federation was accepted as member of FIDE at the 2011 Congress. With that out the way the next item on the agenda was to start hosting international events, and to get some of their players on the FIDE rating list. To do say they enlisted to help of the Oceania Chess Confederation, who helped them organise the 2012 Guam International. Following the format used by the Palau and Solomon Islands Chess Federation's, Guam invited 4 overseas players to join 6 local players in a round robin. The 4 overseas players were all from Australia, as was the tournament arbiter FM Brian Jones. The tournament proved that Guam already has a pool of talented players with Efren Manuel tying with Leon Kempen (AUS) for first prize, on 7/9. Tony Davis (Aus) finished in third on 6/9, with Antony Witt (GUM) on 5/9 in 4th place. The two other Australian participants, Gary Bekker and Tony Weller shared 5th place on 4.5. All the local players will get FIDE ratings from this tournament, which will then enable the Federation to organise more events involving local players. A full report of the tournament, including a number of pictures of the players can be found at the Asian Chess Federation website. The 2012 ACT Championship has ended with IM Andrew Brown and FM Junta Ikeda sharing the title after they finished on 8/9. Going into the final day Ikeda had a half point lead over Brown, but was held to a draw in round 8 after some determined defence by Josh Bishop. This allowed Brown to join him the lead on 7 points, with one round to play. In the final round Brown defeated Matthew Bennet, while Ikeda was once again forced to work hard, finally beating Willis Lo in the last game of the tournament to finish. As the ACT Chess Association happily awards shared titles, both names will be engraved on the Championship trophy. Jeremy Reading finished in third place with 6/9 after defeating Jamie Lee-Guo in round 9. Despite the loss Guo picked up a rating prize as well as performing well above his tournament seeding. Another player who had a good tournament was Lachlan Smart, who scored 5/9 despite being the bottom seed! Full results of the tournament can be found here, while the pgn file of the games is available at the ANU Chess Club website. The 2012 ACT Championship is essentially down to two players, with FM Junta Ikeda leading IM Andrew Brown by half a point. Ikeda had finished the first weekend with 5/5 but was held to a draw in round 6 by a determined Adrian de Noskowski. In the longest game of the tournament Ikeda was up the exchange but de Noskowski captured enough pawns to force a K+N v K+R ending (shades of Queenstown anyone!). Ikeda tried to win the position but on move 115 (with the 50 move limit about to be reached), moved his rook en pris to end the game. This allowed Andrew Brown to close the gap to half a point after he defeated third seed Sam Grigg. Both Ikeda and Brown then won their round 7 games to finish the day with 6.5 and 6 points respectively. Full results from this event can be found at chess-results, while a pgn file of the games is available from the ANU Chess Club page, under the Games link. The cliché that chess is for "nerds" is a stereotype that is strongly resisted inside the chess community. When chess is publicised there is always a strong push (at least in English speaking countries) to point out that chess isn't just for 'brainiacs' and lots of 'normal' people play as well. 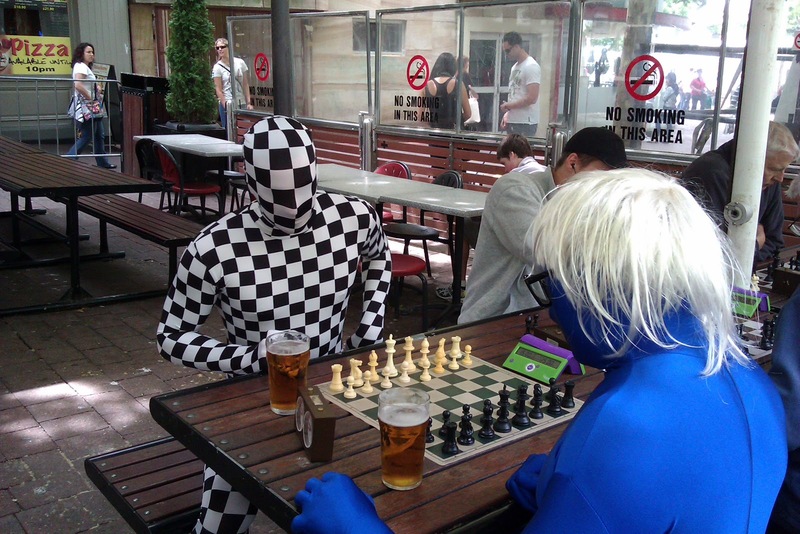 A case in point is this story about chess in Central Queensland. 'Nerdy, brainy kids' gets mentioned in the first line, almost as a way of bringing the non-player into the story, by offering to overturn conventional wisdom. Not that I'm criticising the overall thrust of the story, but the lead in has become a cliché itself. "Most of these people used to play chess when they were younger, but gave it up because they found it too hard"
I haven't posted a game under this category for a while, so I thought I better dig one up. It is from the Gibraltar Open, and while the result (and possibly the game) is indicative of the rating gap between the two players, it does show that you can play a 'hack' line against the Caro-Kan and come up with a quick win. Week 3 of the 2012 ANU Masters saw the top seeds get through this round without a huge amount of difficulty. FM Junta Ikeda played a Benko Gambit against Ethan Derwent, and managed not only to win back the gambit pawn, but another pawn as well. IM Andrew Brown obtained a very strong pawn centre out of the opening and then used them to win material. Martijn Van de Pol had to work harder against Harry Press when some opening prep puled the teeth from the Budapest Gambit. However the wrong plan by Press allowed Van de Pol to coordinate his rooks and launch a decisive invasion. The most exciting game of the night was between Sam Grigg and Miles Patterson. Griig had a slight edge which turned into a huge advantage after Patterson gave up material for an attacking idea that wasn't sound. However it was exactly this plan that saved Patterson half a point after Grigg missed a defensive move allowing Patterson to score a perpetual check. Am I just a chess player, or a person who just plays chess? This thought occurred to me after I attended the funeral of Gunars Lamberts last week. In the eulogy his sister listed a large number of things that Gunars achieved in his life but also pointed out that in his free time he "played chess and played chess and played chess". She even mentioned that the reason he did not marry was that he was "already married to chess". However I'm pretty sure that Gunars would not have felt that he was only a chess player, just that chess was an important part of his life. Of course there are people who have been defined as "just a chessplayer". Such a tag weighed heavily on Paul Morphy as he tried to start a career in law, and Bobby Fischer could not escape the label either. It will be interesting to see where the current generation of players ends up in this regard. While it is impossible to reach the very top without being a full time player, I'm sure that almost everyone has interests away from the board. Of course finding the balance may be difficult which I suspect is one of the reasons why Kasparov the politician is not Kasparov the chess player. But for some perspective on this, it might be having a look at the 60 Minutes story on Magnus Carlsen. The early reviews on this are pretty mixed (it is obviously aimed at the non serious or non chess player) but it at least shows who Magnus is as a person. The plural of anecdote is not 'data', so treat this post as totally non-scientific. From the 'kids today' file comes an observation about the quality of handwriting being taught in todays schools. Having gone through about 30 scoresheets after each round of the ACT Championship I can see a clear difference in handwriting ability based on the age of the authors. Contrary to the claims that kids today aren't as polite/smart/neater as previous generations, the neatest handwriting is mainly by the junior players in the tournament. Those still at school seem to present both legible and intelligible scoresheets, with those submitted by the older generations diminishing in quality. In fact the quality seems to get worse as the participants get older, leading me to assume that despite the claimed death of handwriting skills due to the prevalence of keyboards and texting, today's education system is doing a far better job of teaching children how to write, than it did in my day, and in the days of my parents. FM Junta Ikeda is on track to win his second successive ACT Championship after finishing the first weekends play with a perfect 5 from 5. In today's rounds he played seeds 2 and 3, beating IM Andrew Brown in the 4th round, and Sam Grigg in the 5th. Brown and Grigg share second place on 4/5, after Grigg beat Harry Press and Brown beat Willis Lo in their other games. With 4 rounds to play next weekend, Ikeda has already played seeds 2,3 and 4, meaning Grigg and Brown have to rely on the lower seeds to cause an unlikely upset. As a consequence of sharing second place, Grigg and Brown will play in round 6 giving other players a chance to close the gap. Full results from the tournament are available here while the pgn file of games can be found at the ANU Chess Club website, under the games link. The second day of the 2012 ACT Championship was much like the first, with very few upsets and the top seeds continuing to dominate. After 3 rounds, the 3 players on 3 from 3 are the top 3 seeds. FM Junta Ikeda, IM Andrew Brown and Sam Grigg won their 2nd and 3rd round games to skip ahead of the field. In outright 4th is Harry Press who had a win and a draw in today's rounds. While it is a nine round event, tomorrows rounds will probably decide the likely winner of the event. IM Andrew Brown and FM Junta Ikeda are paired on the top board, while Harry Press is playing Sam Grigg. A couple of wins by any of these players will (a) leave them in front and (b) leave them with an easier run home. Today's featured game is the round 3 clash between Jeremy Reading and IM Andrew Brown. Reading has a very aggressive style, which I suspect is based on the belief that wins with sacrifices count double the value of normal wins. Of course this can lead to situations where a headlong charge into the opponents position can leave you exposed at the back. So it was in this case with Brown's 38. ... Rd2!! coming as a complete surprise to Reading. The 2012 ACT Championship has begun a little earlier this year, running over the last 2 weekends in February. Using the same format as the previous two years, it is a 9 round FIDE rated event, with 1 Friday night round, followed by 2 rounds on Saturday and Sunday for successive weekends. This years event has seen a venue change, with the Tuggeranong Chess Club hosting the tournament at the Tuggeranong Vikings Rugby Union Club. There are 31 players entered, although it is a little thin at the top, with some strong players staying away. The top two seeds are FM Junta Ikeda and IM Andrew Brown, followed by a solid bunch of 2000-1900 rated players. The first round saw no upsets, with the top half beating the bottom half 15 zip. There were a couple of interesting games, but the difference in strength generally told. Probably the most interesting position is the one shown, which occurred in the game between Matt Radisich and Tim Pearce. Radisich thought he had set a particularly evil trap, where if the pawn on g2 queens he has a forced mate. Pearce believed and instead chose 42. 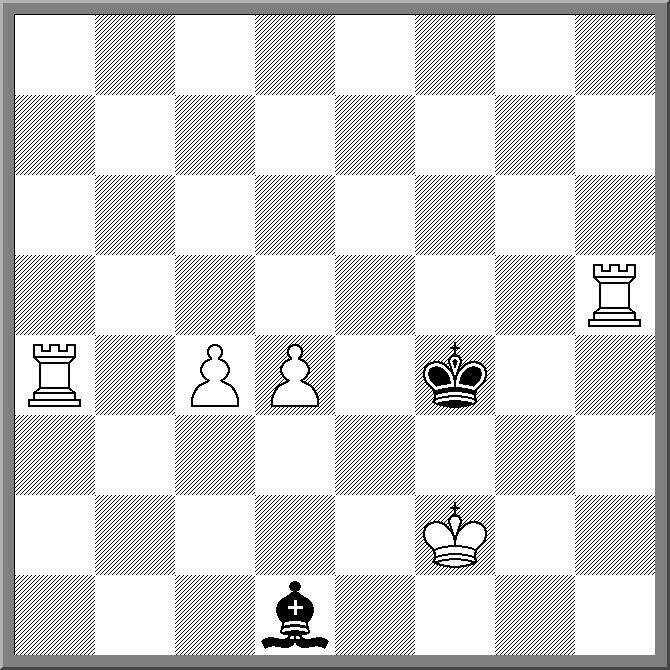 ... Nxf5 which also lost, the 43.Nf7+ Kc6 44.Rc7# However 42. ... g1(N)+! would not only have produced 5 knights on the board, it would have left Black with the upper hand. Results and pairings from the tournament are available from chess-results.com, while a file of games is available from the ANU Chess Club site (under the Games link). FM Junta Ikeda has taken the outright lead in the 2012 ANU Masters. In one of the key games of the tournament he defeated IM Andrew Brown in their second round game. Ikeda is now on 2/2, and surprisingly is the only player to maintain a perfect record. Sam Grigg and Andrey Bliznyuk recovered from round 1 losses to score their first wins of the tournament, while Miles Patterson has moved to second place after beating Harry Press. Results, games and crosstables for this event can be found at the ANU Chess Club website (under Current Events). I'm convinced that everyone in the world has a double. Of course with 6 billion people on the planet the chances of someone looking like someone else are pretty high. For example, if you've ever seen "Comprehensive Chess Course", it may look like I'm on the cover, but I can assure you it is someone else. Armed with this information, you can even turn this into a game. In a non-chess setting you can try and spot "chess" look alikes. It doesn't have to be an exact replica, but they must have enough similarity for your opponent to agree that their is some resemblance. (It might be the physique or a haircut that tips you off). While I was in Sydney last weekend my son spotted "Stephen Solomon" walking along Broadway, while I saw "Trent Parker" in a bookshop. (Actually the real Trent Parker was winning the NSW Country Championship in Newcastle at that time!). You get a point for every look alike you spot. However if you spot a look alike and it turns out to be the actual person, then you instantly win the game. This is why you need to play in a non-chess setting, otherwise the game is too easy. I'm not sure what the record is more the longest unmoved piece, but Rupert Jones tipped me off about a game from the latest round of the 4NCL. David Eggleston kept his bishop on c1 for 51 moves. When it did move, it immediately got snapped of by his opponents knight. According to Rupert, it was constant position pressure from Simon Buckley that was responsible for the bishop immobility, pressure which eventually resulted in a winning ending. Yesterday the family went on an excursion to Sydney to the a Harry Potter Exhibition (Costumes, props etc). While it was interesting, is was a little too small and a little bit crowded. Amongst the props they did have a couple of giant chess pieces used in the chess game from the first move (and they were quite big). Seeing the pieces reminded me of a post I made about 5 years ago titled Harry Potter Teaches Chess. It was about the series of magazines that both taught you chess and allowed you to build a complete set. I purchased about a dozen issues before I ran out of puff, although I have seen complete sets advertised on eBay. At the time I wondered if there would be a wave of juniors taking up chess due to the series, but I must confess I haven't seen any evidence of this at all. I might ask my coaching groups when I next see them, but for now I suspect I over estimated the influence that Harry Potter really has. Yesterday at Street Chess we had two visitors who may have provided a solution to the problem of computer cheating. As it is very easy to hide a portable chess computer on your person (or have a program running on a concealed smart phone) the question has been, how to detect such a device. Metal detectors are pretty expensive, while strip searching players is both time consuming, and possibly distasteful. The answer is "Morph Suits". If each player is required to wear an official tournament "Morph Suit" then there are very few places to hide electronic equipment. And as the suits cover the face, it may also solve the problem of players intimidating their opponents with aggressive facial expressions. But given the tight fitting nature of the outfits, this intimidation may instead take other forms. IM Andrew Brown has also sent me a link showing the "Morph Suit" in action. It is a youtube video and you can see it here. While the suits aren't as stylish as the one in the photo, it does show how practical they are. One of the criticism of blogs, especially political ones, is that they serve as a kind of 'echo chamber', simply repeating what other blogs have posted 10 minutes earlier. Of course those that make this criticism never direct it at their own side of politics, only at those they disagree with. But it is true that blogs do draw their information from limited sources. And in doing so some strange connections can appear. For example, my post yesterday mentioned Adam Raoof, an English chess organiser. On Facebook I noticed he had recommended a post on the YorkshireChess website, specifically an interview with FM Rupert Jones. Regular readers of the blog would know that Rupert is a team mate of mine on the PNG Olympiad team, as well as being a good friend away from the board. And in the interview Rupert then plugs this blog, as one of the chess sources he regularly reads. So having come full circle, I also recommend you read the interview, as it does provide both a good background on Rupert's career as a player and organiser, as well as giving a good tip on becoming an FM! I finally saw the new Sherlock Holmes movie last week, and like the first of the modern remakes, I quite enjoyed it. I was aware in advance that one of the plot points was a game of chess between Holmes and Professor Moriarty, although I did not realise it would appear so late in the movie. Nonetheless even this was well done, as I believe that well known chess organiser Adam Raoof was an advisor for this scene, although I failed to spot his name in the credits (and I read every single one of them!). The only minor quibble was that the clocks seemed to start on the hour, rather than at 5 minutes to, if correctly set for a game of blitz. Of course the fact that Sherlock Holmes played chess was a creation of the script writers, as he did not do so in the Conan Doyle stories. He did in fact comment on the game in The Adventure of the Retired Colourman saying ‘Amberley excelled at chess – one mark, Watson, of a scheming mind’, but that was about it. Since the publication of the original works, other have attempted to link Holmes with chess, including Raymond Smullyan's "The Chess Mysteries of Sherlock Holmes". If you want to investigate these later attempts then Edward Winter has a good summary here. while it starts out as one puzzle, it actually turns into four, with a different solution each time. The first puzzle starts with the diagrammed position. In the given position White first takes back the last move they played, and then checkmates in 1 move. Hopefully you don't find it too difficult, as 3 more problems await. 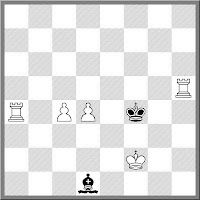 Having solved the first one, you move everything up one rank (eg the bishop is on d2, the white king is on f3 etc). Again White has to take back their last move, and checkmate in 1 with another move. Once you've solved this (harder) problem, you move everything up another rank for problem 3, with the same conditions, before doing it one more time for question 4. This remarkable set of problems were composed by M Abadshaev in 1938, and until I read Exploration in Chess Beauty I had never seen them before. Enjoy! The 2012 ANU Masters kicked of this evening, with a number of competitive games. IM Andrew Brown against Andrey Bliznyuk was probably the most interesting pairing on paper, although the Grigg - Ikeda match was also worth watching. The Brown Bliznyuk did live up to expectations with both sides trying to gain space on opposite sides of the board. In fact it wasn't until around move 25 that the first captures were made. For most of the game Bliznyuk seemed to hold the advantage, but at some stage he missed a fork and lost his queen. "Exploration in Chess Beauty" is the aptly named book by IM Andras Toth. It is a book that looks at chess problems and the joy that such problems bring, both to the solver, and to the observer. Toth highlights this feeling with a story about his own father. He recalls showing his father the solution to a problem by Kubbel. Despite his own modest chess ability, his father was so impressed by what he had seen, that he grabbed the set, the problem and Andras himself and went next door to share the solution with his brother, an even weaker player. The fact that two "non serious" players were so excited about a chess problem had a lasting effect on Andras. While the starting point of the book, as well as each of the chapters are problems related to a theme ("The Mighty Pawn", "The Tricky Knight", "The Secrets of the Starting Position"), the book does not deal exclusively in puzzles. There are a number of games drawn from contemporary praxis, which utilise the same ideas and motifs. An example is in the section on pawns, where after demonstrating the power of the pawn in constructed positions, the game Serper -Nikolaidis shows how mighty the pawn can truly be. It is this marriage of the "theoretical" with the "practical" that I feel is the real strength of this work. If you have read "Secrets of Spectacular Chess" then the theme of this book may seem a little familiar. Toth recognises this, even going so far as to declare "Secrets of Spectacular Chess" as the best book in this area. Nonetheless he hopes that he has written at least the second best book in the field, using a simpler and less scientific approach. While devotes one chapter to the beauty of composing problems (and the technical issues involved), he does not get bogged down in the jargon of composition. While this book is good enough to stand on its own, it is worth mentioning the form it takes. It is an eBook from e+Chess, and is available for the iPad/iPod/Iphone platform. The benefit of this format is twofold. Firstly the solutions to each of the problems are initially hidden, and will only be revealed at the time of your choosing. Secondly, you don't need a chess board to play through the solutions or games, as the book comes with its own board, and you can simply move through the games with the touch of a finger. Overall I found this book both interesting and challenging, and I would recommend it to anyone who regards chess as more than simple competition. Toth has clearly put a lot of effort into a subject close to his heart, and it shows in the final product. One of my favourite "small" tournaments is the Dubbo Open. Of course it isn't actually that small a tournament with fields of 40+ playing over the last few years. However it does have to work hard to get these numbers, as it is about 400km from Sydney and Canberra. This years event will be on the weekend of the 17th and 18th of March, at the usual venue of the Dubbo RSL Club. It is a 6 round event played with a time limit of 60m+10s per move. Entry fee is a very affordable $45 ($35 concession, $25 juniors) and the organisers have guaranteed a first prize of $350. It is also part of the 2012 Meyer-Tan Grand Prix, as a class 2 event. I'm travelling up again this year, although only as an arbiter rather than a player. I expect the usual contingent of ACT players to make the trip, as well as a number of players from Sydney and Newcastle. If you have never sampled the delights of a country chess tournament (which is often played at a different tempo than city ones), then I highly recommend this one. Further details can be found at the Dubbo Chess Club website. The title of this post comes from the sport of Rugby Union, specifically New Zealand Rugby Union. It was said as part of a debate about whether it was better to have restricted competitions, where the very best players did not play. The comment was an observation on where those same "best" players came from. It seems the stronger the competition the stronger everyone is, not just the best players. This isn't normally an issue in chess, where almost all competitions are open, or if they are restricted, restricted at the bottom, rather than the top. However I had a conversation yesterday that brought this issue to mind (NB I'll leave names out of it, although I'm pretty sure they read this blog and would even recognise themselves). It was about reasons for not playing in an event which you are likely to win. The reason given was that by doing so, you might deprive regular players of a change to win the event, and this may not be looked upon favourably by the regulars. While this is generous sentiment, if it was me I wouldn't be so worried. What might be taken away in prizes is more than compensated by the opportunity of the regulars to play chess at a higher level. Given the choice between easy prize money or a chance to be a better player I'd guess at least 90% would want to be a better player. And if popularity is the measure your looking for, I'm sure that playing is going to generate more kudos than staying away. While I was being awoken at 6am on my last day in Queenstown (courtesy of a fire alarm), another group of player were just getting to sleep at around the same time. According to Shannon Vuglar, one of the participants, they were playing a chess variant called "Arm-Brain". It is a partnership game, where one of the players is the "Brain" and the other is the "Arm". The game is played using the normal rules of chess except that the "Brain" must name a type of piece that is to be moved. It is the job of the "Arm" to then move a piece of that type. The players cannot confer, except for the "Brain" naming a piece. It is up to the arm to decide which move is best, including which piece to move, if there is more than one piece of the same type (eg a choice of bishops to move). According to Shannon, it helps to team up with a strong player, as this compensates for the "other" player. In his case, a partnership with GM Gawain Jones yielded victories over a team of greater "average" strength (an IM and FM), where they took turns at being the "Arm" and the "Brain". Whether this is true in all cases would clearly require more testing. Nigel Short has won the 2012 Gibraltar International, after defeating Womens World Champion Hou Yifan in a 2 game playoff. The finished on 8/10, after Short won his last round game to catch Yifan, who only drew with Mamedyarov. In the playoff match, Yifan failed to take advantage of a Short miscalculation in the first game and lost. The second game ended in a draw, giving Short the title. Both players had a TPR of over 2800, as did Michael Adams who finished on 7.5 Slightly further down was Swedish GM Emmanuel Berg who finished on 7.0. He got there with a nice win in the final round, which included a queen sacrifice for a mating attack. Hot on the heels of the 2012 ACT Lightning Championship comes details of the ACT Championship. As in the previous few years it will be a 9 round FIDE Rated Swiss, played over consecutive weekends. However this year it is a little earlier in the calendar, and begins on a Friday evening. FM Endre Ambrus was the convincing winner of the 2012 ACT Lightning Championsip, scoring 10 wins and a single loss. He finished a point and half ahead of Roger Farrell and FM Junta Ikeda, with IM Andrew Brown a further half point back. Ambrus's only loss was to Farrell in round 6, and he defeated everyone else who finished in 8th place or better. Farrell kept pace with Ambrus up until round 8, when a draw with WIM Emma Guo caused him to fall behind. Ikeda recovered from a slow start (1.5/3) but his loss to Ambrus in round 8 ended his winning chances. 33 players took part in the tournament, which offered $600 in prizes ($300 for first). Full results of the event can be found at this link.